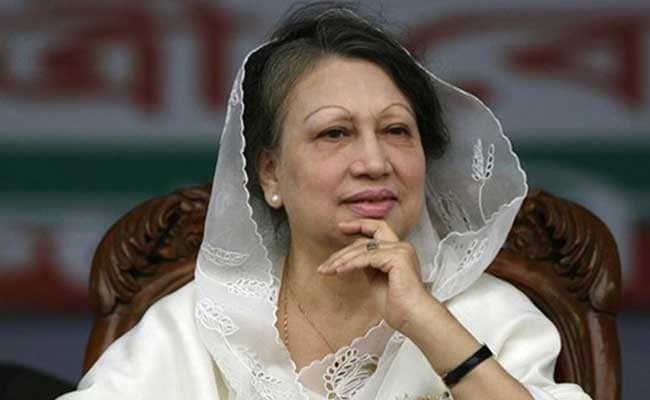 The Bangladesh High Court on Tuesday delivered a split verdict over whether imprisoned former prime minister and main opposition Bangladesh Nationalist Party's chief, Khaleda Zia, should be allowed to contest the upcoming general election. One of the judges of the two-member High Court bench favoured Ms Zia's candidacy while the other ruled that she was disqualified from the polls for being a convicted prisoner serving a 10-year jail term in two graft cases, court officials and lawyers said. "As the two judges could not reach a consensus, in line with the practice, they referred the matter to the chief justice who will now send the case to another bench for hearing the case," an official said. The ruling came after 73-year-old Ms Zia challenged an earlier decision of the Election Commission to scrap her candidacy as the ex-premier filed nomination papers for contesting polls from three constituencies. Senior judge of the bench Justice Syed Refaat Ahmed in his ruling asked the Election Commission to accept her nomination, and sought its explanation on why its decision to scrap her candidacy should not be declared illegal. However, the other judge, Justice Iqbal Kabir, blocked the Bangladesh Nationalist Party leader from contesting the polls. She had on December 9 challenged the commission's order disqualifying her from contesting the polls, while the High Court had earlier ruled that those jailed for more than two years with their appeals pending in court cannot contest polls. She has been in prison since February this year when a lower court sentenced her to a five-year term in the first of two corruption cases, while a special court in Dhaka has ordered her appearance in a third graft case. Meanwhile, formal campaigning for the December 30 polls started on Tuesday. Prime Minister Sheikh Hasina began the campaign for her party, Bangladesh Awami League, from the southwestern sub-district of Tungipara, the birthplace of her father and Bangladesh's founder Sheikh Mujibur Rahman, who was assassinated in a 1975 coup along with most of his family members. Ms Hasina is contesting polls from the Tungipara constituency, and set to travel across Bangladesh to rally support for her party candidates and alliance partners, including former president HM Ershad's Jatiya Party. The Awami League's arch rival, BNP, also launched its campaign in the absence of party chairperson Ms Zia and her son and fugitive acting chief Tarique Rahman. He is now living in London ostensibly to evade the law after a court sentenced him to life imprisonment for masterminding a grenade attack in 2004 that killed 24 Awami League leaders and activists. The absence of the two top BNP leaders has pushed the party into a state of disarray. The BNP had boycotted the previous 2014 polls demanding an election time neutral non-party government, and instead waged a violent street campaign in subsequent years. Analysts say political and legal considerations have forced the BNP to take part in the upcoming polls as it could lose its registration with the Election Commission as a political party if it boycotted polls for the second consecutive time, even as it faces structural erosion from within. The BNP recently joined the new opposition alliance National Unity Front (NUF) under the leadership of eminent jurist Kamal Hossain.